UPDATE: Taylor Shiflet was found safe Tuesday near Hotel Circle in Mission Valley. A mother is pleading for help after her daughter seems to have vanished while in San Diego for a job interview. “Someone has to see her. You can’t forget her. She’s got these gorgeous blue eyes and this great personality,” Chris Shiflet said. Taylor Shiflet, 19, of Phoenix, has been missing in San Diego for a week. “I just want to find her,” Chris Shiflet said. Last Monday, Taylor and her boyfriend, Matthew Gray, left Phoenix on a Greyhound bus for San Diego for job interviews they had lined-up on Tuesday. Taylor was last seen the same day at a Days Inn on Rosecrans St. in the Midway District. “The last anyone saw of her Monday, they went to check into the hotel and the hotel wouldn’t check them in because they didn’t have a credit card for the security deposit,” Chris Shiflet said. Taylor's boyfriend turned up, but she hasn't been seen or heard from since. Gray was arrested on Ibis St. in Mission Hills at 1:20 a.m. Tuesday. Neighbors said he was drunk and somehow made it into a fenced backyard and couldn’t get out. When he was arrested he was crying, a resident said. She said he left two rings in their backyard. “Matthew was arrested Tuesday for being on private property and not being able to take care of himself and now he’s in the San Diego County psychiatric hospital,” Chris Shiflet said. “When I ask him where my daughter is he just says 'I lost her. I left her at the beach,'” Chris Shiflet said. Taylor had a bus ticket back home for Wednesday and plans with her mom on Friday. Chris said Taylor shared a cell phone with Gray. “My first gut is he hurt her and won’t tell us where she is, that's my first gut. I pray he didn't, but that's my first gut. My second gut says someone stole her and is using her, she's gorgeous,” she said. 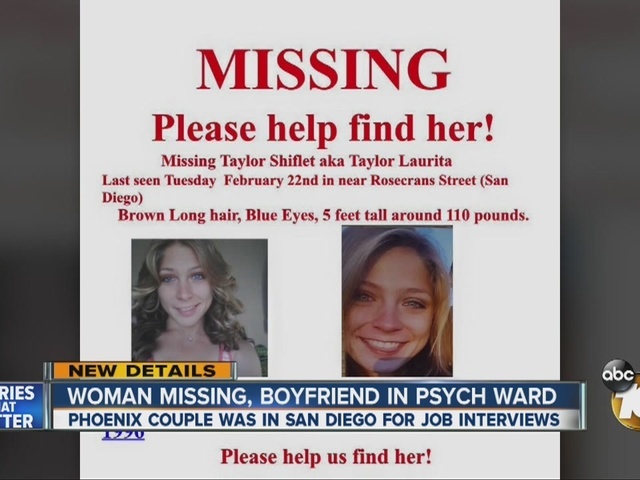 Taylor's mom was just in San Diego handing out missing flyers at Ocean Beach and Mission Beach. “I’m honestly afraid if she can’t call me there’s a reason for it,” Chris Shiflet said. “It kills me, I don’t want to be alive, I don’t want to live without her. She’s my baby,” Chris Shiflet said. If you see Taylor you are asked to call the San Diego Police Department.